Anticipation of a Franz Josef Glacier hike along ominous crevasses woke me up early this morning. Rather than make the usual instant oatmeal in my New Zealand hostel, I slid out of my bunkbed deciding the glacial adventure called for a splurge: a restaurant breakfast, or “breakie,” in Kiwi terminology. Restaurant forays have become an indulgence because New Zealand food costs are shockingly higher than in the US. This journey began with a business trip to Auckland. After four days in five star hotels, I shed business attire and donned my fleece hiking wardrobe. It’s November, but in the southern hemisphere, the season is late spring – cool and rainy. I flew to the South Island to backpack the famous Milford Track and lesser known but more beautiful Routeburn Track. Today I am in Franz Josef New Zealand, a small town named after one of the blue New Zealand glaciers that cling from giant Alp-ish mountains on the rainy west coast of New Zealand’s South Island. The glacier, in turn, was named after Emperor Franz Joseph I of Austria by a German explorer in 1865. I make my way to the Franz Josef Glacier Guides office with a skip in my 56-year-old step: this is going to be an adventure of a lifetime. Yesterday I was hefting my 40-pound backpack along Robert’s Point Track that overlooks parts of Franz Josef Glacier, but today I will be light as a bird – without my pack – walking on the ice. “First we need to go over this checklist and sign the waiver,” says the young woman who, acting as a Safety Nazi for the Franz Josef glacier tours, brandishes her clipboard in my face. And speaking of young, I’ve already noticed that most of the other clients signing waivers and receiving their crampons ahead of me are twenty-somethings. “Hey, aren’t there any oldsters trekking the glacier today?” I think to myself. I have a sinking feeling. The checklist reminds me that I forgot to bring my orthopedic knee brace – for the torn anterior cruciate ligament (ACL) in my left knee. The prescription device is lying under the bunk back at my Franz Josef accommodation, the Glow Worm Cottages Backpackers Hostel. Joint pain? Oh, buggers, I forgot to take ibuprofen as a prophylactic for the knee pain always brought on by hiking or skiing. Headaches? Well, I haven’t had a migraine for three months. Or has it been two? Next box: Dizziness. My blood pressure meds do make me somewhat dizzy, if I stand up fast. 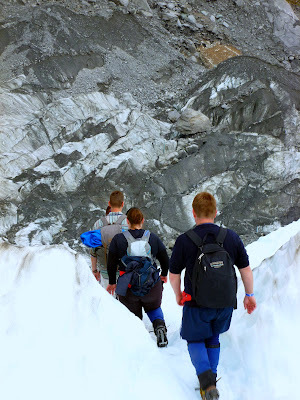 Maybe I can remember to not stand up too fast after I crawl out of that ice tunnel promised in the color brochures of all the Franz Josef glacier tours. Fortunately, I didn’t take my blood pressure medicine today because it’s a diuretic, and I didn’t think there would be many toilets on the 7.7-square-mile snowfield. A sinking feeling is bringing me down like the Titanic. What if I admit to all my afflictions? Will they let this old lady on the expedition? I didn’t train, come this far, and carb up with an expensive breakie to be turned down now. Looking down the list, I think, “Well, at least I’m not pregnant.” I quickly check all the “No” boxes and sign the form. Nazi girl has disappeared so I take the clipboard and stand in line behind the kids, who are waiting in que to get outfitted for the Franz Josef glacier walk. But now I am feeling REALLY bad. Lying is just wrong. I can’t believe that I lied on the form, not once but six times. “You’re not pregnant,” I try to reassure myself again as I get to the front of the crampon line. “Did you sign your form?” the cute mountaineering gear guy asks. “I have an ACL problem. 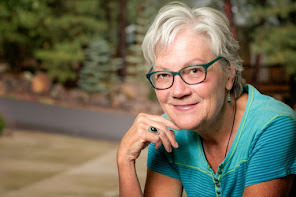 I blew out my ACL but it was 20 years ago and I am really careful, that is why I brought my hiking poles,” I babble like an idiot, lifting my poles above the counter to show him. He scratches off the “No” and checks “Yes” in the knees box. “You’ll have to wait over here,” he points to the corner. In a few minutes the first person over thirty that I had seen since I’ve been inside the Franz Josef Glacier Guides office walks over. “No, I didn’t go under the knife, but I keep the muscles around my knees well-exercised – it holds it all together pretty well. I’m an avid hiker,” I add holding up my poles again as if they were health certificates. He makes some notes on my form. I hold my breath. I really want to go on the Franz Josef glacier hike. “Go get your crampons,” he says after giving me special instructions on how to take care of my knees while walking with crampons. I am now issued a Gore-Tex glacier jacket, wool hat and mittens as well as the crampons, and I join the twenty-somethings on the bus. We’re shuttled to a trail where we walk over a mile to the terminus of Franz Josef Glacier. Crossing a rope stretched across the trail that keeps out the “unescorted” riffraff, we begin our climb over the rocky moraine towards the ice. 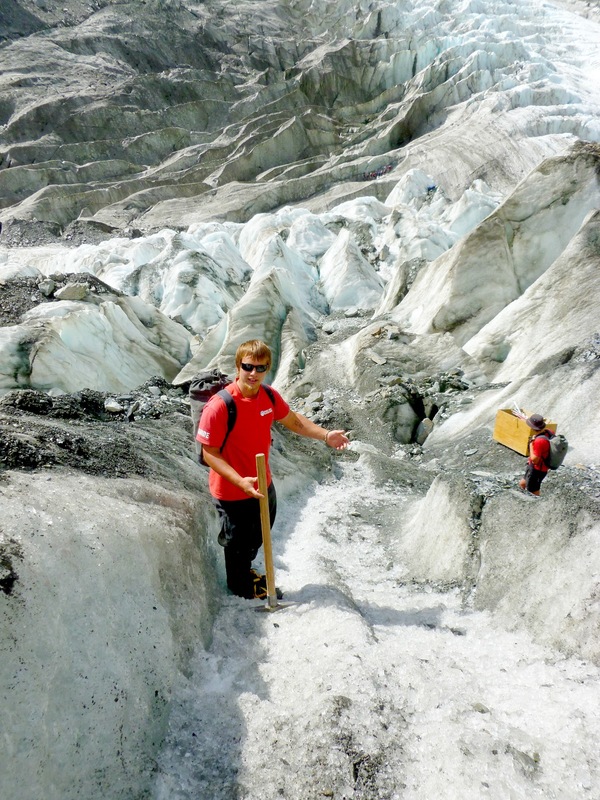 Later, he warns us to stand back as ice chips fly off his hammer as he cuts steps into the glacier. 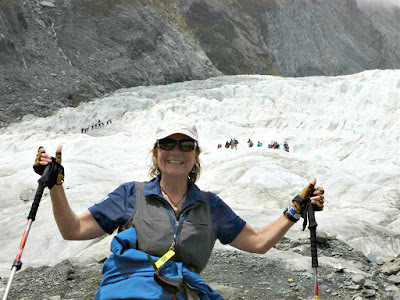 We move slowly up the Franz Josef Glacier in our cumbersome new footwear, but the sun is shining on our smiling faces. Small winds, cooled by the ice field, move around us from time to time. The crisp mountain air is heavenly. “When was the last time you had a sunny day like this?” I ask looking at the turquoise skies. “Oh, about a week ago. But in two days we’re having Biblical rain,” Rooke answers. This is a rainy part of the world and the river flowing from beneath the glacier rises and falls with those torrential rains. Exiting the ice tunnel, I give no thought to standing up fast or not. No problem with dizziness today. The blue ice is mesmerizing and I am experiencing this world as I never have before. Eventually we reach a height of 620 meters (6674 feet) on our Franz Josef glacier walk and sit to eat our lunch. I drink in the magnificence of one of the most beautiful of all New Zealand glaciers. “Don’t forget to relax in the Glacier Hot Springs tonight – it’s included in your guide fee,” reminds Rooke. "UNSTOPPABLE STACEY" Wittig is a middle-aged adventure travel writer. Only one week after she returned from New Zealand, two twenty-somethings were killed while hiking without a guide at Franz Josef Glacier. To search other Franz Josef accommodation click here and you’ll be directed to Booking.com. This article was first published in Lake Erie Lifestyle magazine after a trip in November/December 2011. Some facts may have aged including the fact that Franz Josef Glacier and other New Zealand glaciers have retreated so much since then that you must now take a helicopter tour to the glacier. You may book Franz Josef heli hike tours from www.franzjosefglacier.com and Fox Glacier heli hike tours from Fox Glacier Guiding at www.foxguides.co.nz. Please call ahead to verify information. Disclosure: The travel writer paid for her Franz Josef glacier tours and Franz Josef accommodation. 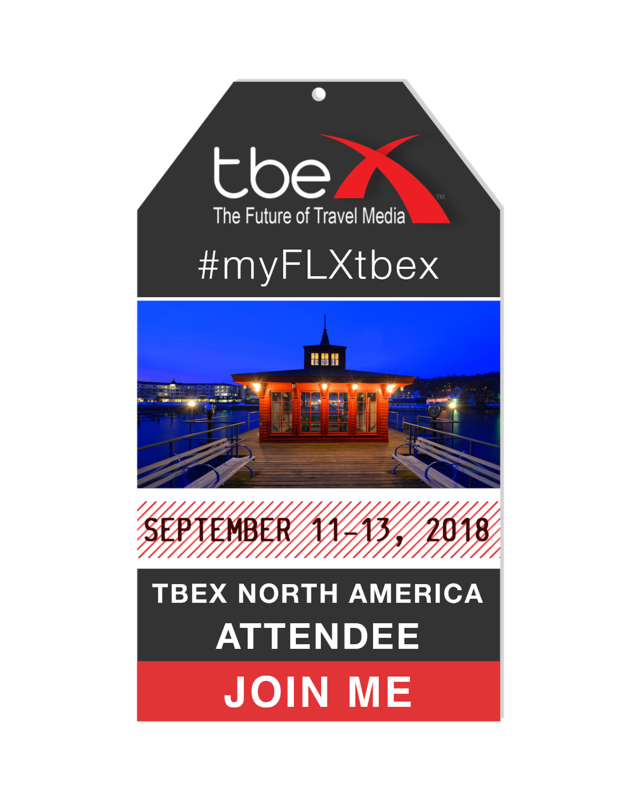 The article contains affiliate links and if you make a purchase, UNSTOPPABLE STACEY will get a small commission to help pay for publication of this blog. Thank you in advance. I can’t stop exploring the world (I blame it on my father’s Viking blood) and write about my adventures – many as a solo traveler. Life isn’t always rosy; I lost my firecracker reasoning skill to head injury in a horrific rollover accident that should have taken my life. • the heart-filled appreciation for those who share my path. There’s really nothing like a near-death experience to make you want to start living. "You really captured the spirit of the area." "I just read your article. It was fantastic." Wittigwriter@gmail.com | Copyright Stacey Wittig. Reprints authorized with link back to this site. Awesome Inc. theme. Powered by Blogger.